Still a favorite ride of many, Alpengeist at Busch Gardens Williamsburg was a really big deal when it opened, both figuratively and literally. The B&M designed inverted coaster was the tallest of its kind when it opened, and I do believe B&M have not done a taller inverted ride since. 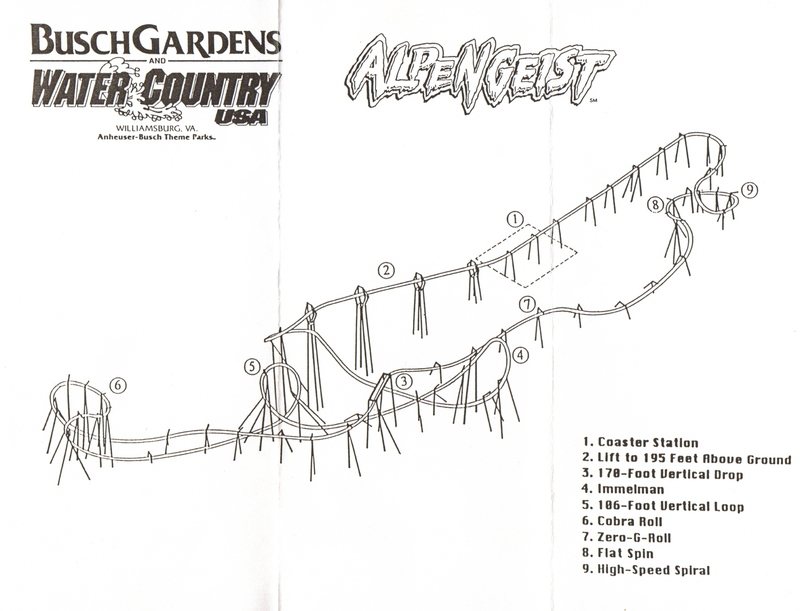 Here's the layout of the coaster that was released with the press materials. Due to the terrain under the coaster the lift is 195 feet tall but the drop is 170. 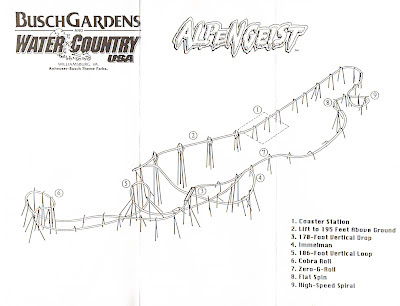 They also list the vertical loop at 106 feet, which is pretty big for an inverted ride. Alpengeist features a total of 6 inversions along the 3,828 feet of track. 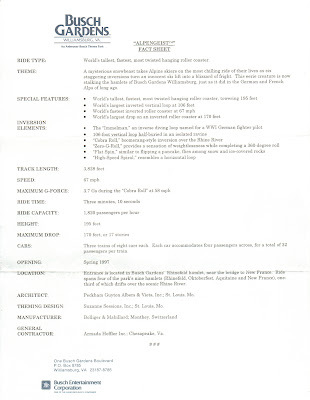 You'll have to click this one to see the details, but here is a fact sheet for the coaster, also released with the press materials. It gives a bit of the back story of Alpengeist which includes a "mysterious snowbeast" and a "blizzard of fright." This is the only time I've heard a flat spin described as "similar to flipping a pancake!" The big reveal has been made - seen above are the trains for The Smiler, Alton Towers' new many (many) inversion sure-to-make-you-happy roller coaster. There was much speculation about whether the coaster's trains would feature over the shoulder restraints, and now the park has confirmed for us that indeed it will. 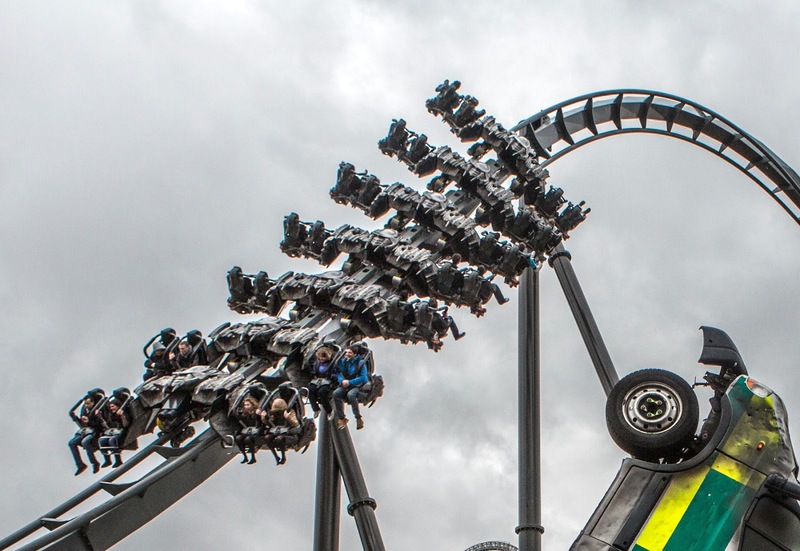 Gerstlauer, the manufacturer, has used both styles of restraints on their rides in the past - but with the intense inversion count on the Smiler I'm not too surprised the overhead restraints were used. The coaster's construction is still progressing, seemingly a bit slow, though. The park just recently started to assemble the "marmaliser" which is the crazy multi-legged contraption in the center of the ride that is going to make passengers happy in a multitude of ways. For a full update of that progress - and more - check out this batch of photos from Towers Times. Carowinds Opens For 41st Season with Dinosaurs Alive! 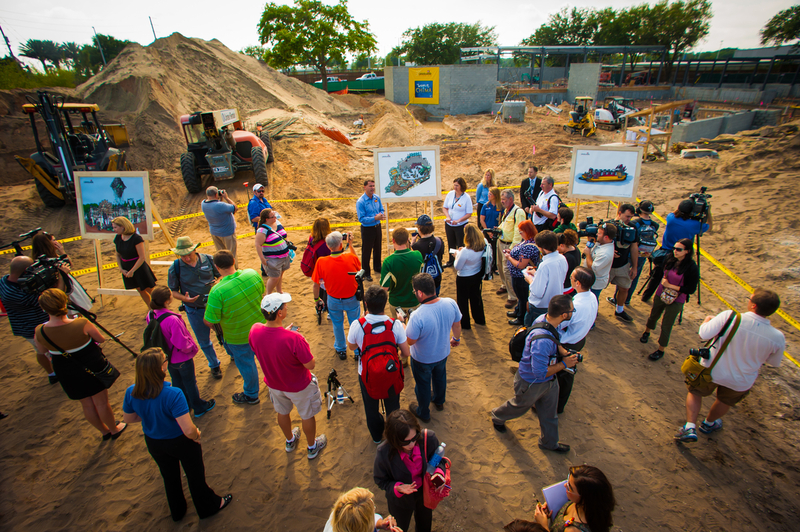 Today was the opening of Carowinds' 2013 season, and also the premier of their latest attraction, Dinosaurs Alive! Much like at the other Cedar Fair parks, Dinosaurs Alive! 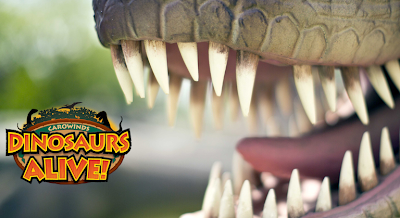 is an extra-ticket attraction that allows guests to take a leisurely stroll through a five acre prehistoric landscape filled with 32 animatronic dinosaurs. Education is an important part of the experience, and there's plenty to be learned about the extinct creatures along the way. The exhibit has taken up the location of a former car ride along with the former picnic pavilion area. Also new this year is a dinosaur themed movie in the park's 4-D theater, a new live entertainment show featuring the Peanuts characters, and the completion of Thunder Road's multi-year rebuild. With the removal of the old picnic area the park has created the all new Carowinds Grove, a large new facility capable of hosting up to 15,000 people in one day. The new catering area has a much more relaxed feel, and even has a building that can be used as a VIP area for corporations who really want to treat their employees! 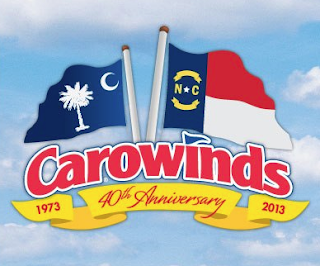 Carowinds is also celebrating their 40th anniversary this year, having opened in 1973. They just released this video of a poem written before the park opened for the very first time, and I have to say it is pretty neat. Congratulations to the park on their milestone! 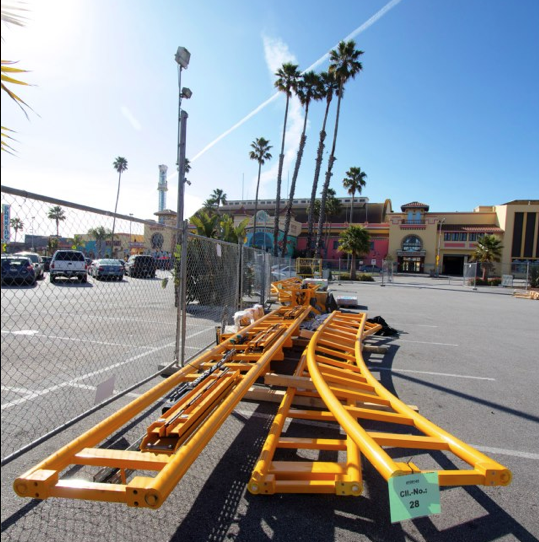 It took a long journey starting in Germany, crossing the Atlantic and through the Panama Canal, but the ride pieces for Santa Cruz Beach Boardwalk's Undertow roller coaster have finally arrived in sunny California! 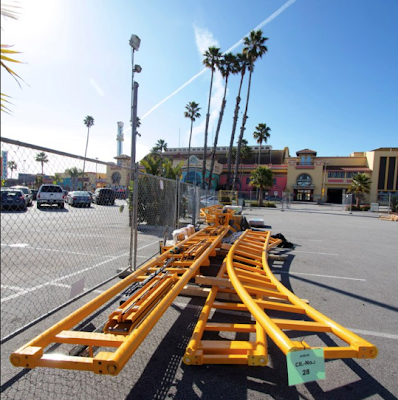 The yellow track and aqua supports are now on site, and the park is getting ready for a quick instillation. In fact, they report that they are starting to "look at the instruction manual" which is pretty important, indeed! 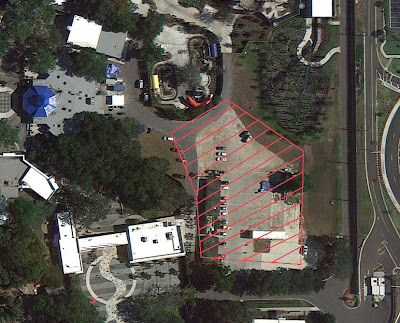 Undertow will not use permanent foundations, so once they start building the ride will go up very fast. 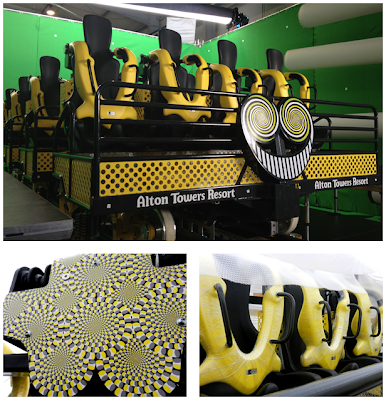 The coaster will feature spinning cars that soar along 1,410 feet of track, starting from a maximum height of 50 feet. The above photo of the track was shared by the park, they have more available here. A local news station did a story on the ride and it's arrival as well, you can view that here. 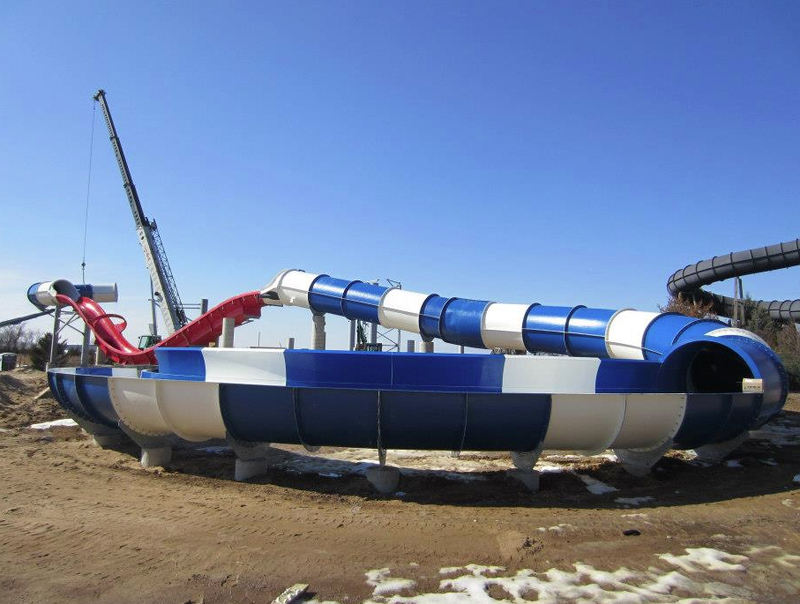 Things have been pretty quiet since Lake Winnepesaukah announced an entire brand new water park for the 2013 season, but that by no means it has been quiet at the park. Almost immediately after the announcement the bulldozers arrived and work has continued day after day. And much progress has been made! 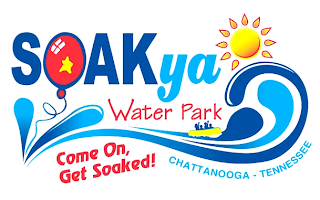 The Soak Ya Water Park will feature multiple attractions when it opens, including several water slides, a large action river, children's play areas and more. The needed amenities will be built as well, including a new entrance to the water park and adjacent train station. Interested in seeing just how much progress has been made so far? I was too, and thankfully the park has released this video to help us out! Looking good! Whether by wrecking ball or careful deconstruction, the Dania Beach Hurricane is coming down sooner than later. The latest on the wooden roller coaster, which hasn't operated since 2011, is that the ride will be torn down by the end of May if no one wants to dismantle it for rebuilding elsewhere. The owners of the ride are offering it to a non-profit for free so long as they agree to tear it down and haul it away. The owner of the ride reports that it cost $6 million to build in 2000, and would cost $10 million to build brand new today. However, moving the ride and rebuilding could cost as little as $3 million by their figures. The roller coaster part of the Boomers family entertainment center when it was open, located in Dania, Florida - not far from Fort Lauderdale. It was one of only two rides to be built by Coaster Works, Inc. Scott & Carol shared some photos and memories of the 100 foot tall ride late last year, and the Hurricane received favorable reviews from many riders. All done! Well almost all done! The track and supports kept flying up during the past two weeks, and now Coast Rider at Knott's Berry Farm is just about complete. 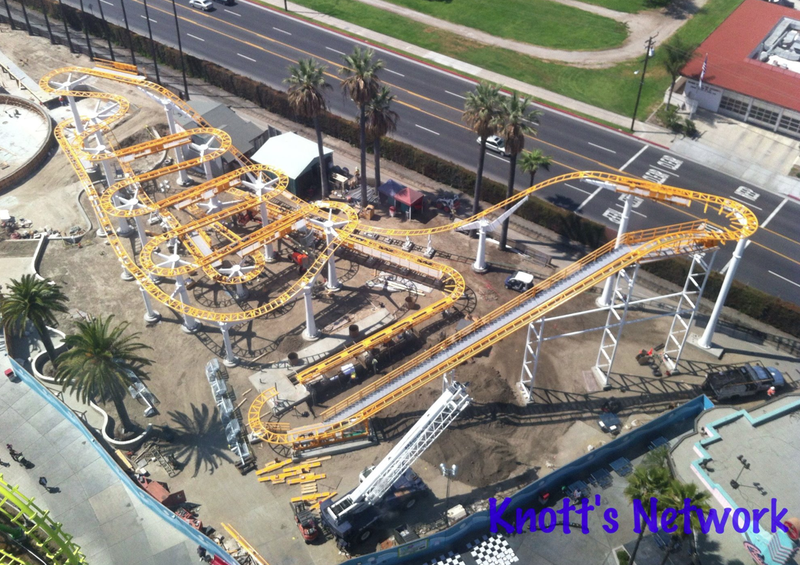 Seen yesterday in a photo from Knott's Network, the new coaster is just one track piece short of being complete. 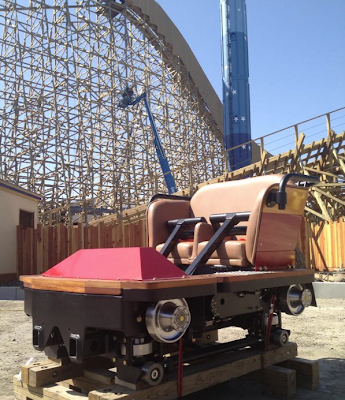 Coast Rider is the 10th roller coaster at the Farm. 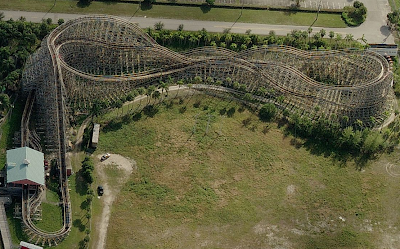 Coast Rider is a Mack extended wild mouse, similar to rides at Canada's Wonderland, Kings Dominion, and several Legoland parks. It features a large first drop, around 50 feet, that isn't located on the traditional wild mouse design. For a full update - taken just a few days ago - check out this from Westcoaster. 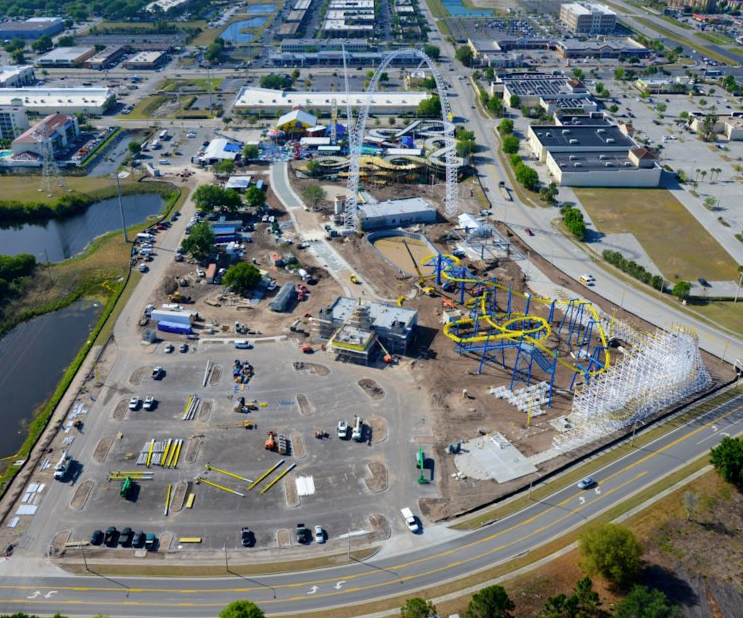 The foundations for the Boardwalk's other two rides are being poured as well, as work kicks into over drive as the May 25th opening date draws closer. Coney Island amusements and boardwalk attractions traditionally start their season on Palm Sunday, and this year was no different. Well, it was different. 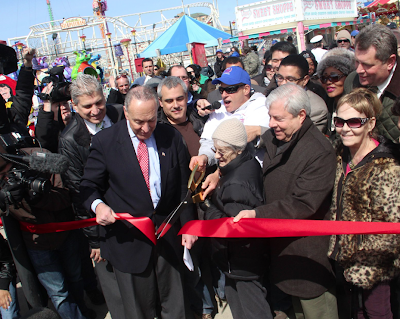 This year's opening this past Sunday meant a lot after spending five months recovering and rebuilding from Hurricane Sandy. When Sunday rolled around both Deno's Wonder Wheel Amusement Park and Luna Park and Scream Zone opened their rides, and the shops and food stands along the boardwalk were ready to go. According to reports, Coney Island actually had one of their biggest season openings ever, with all the publicity that surrounded the reopening. This article from Crain's New York Business details just how successful the opening day was. Sadly we had a bit of a snow storm the following day, so operations were put on hold a bit. Still it sounds like crowds flooded the parks and boardwalk on Sunday, when the rides were blessed (also a traditional) and started up for the year. 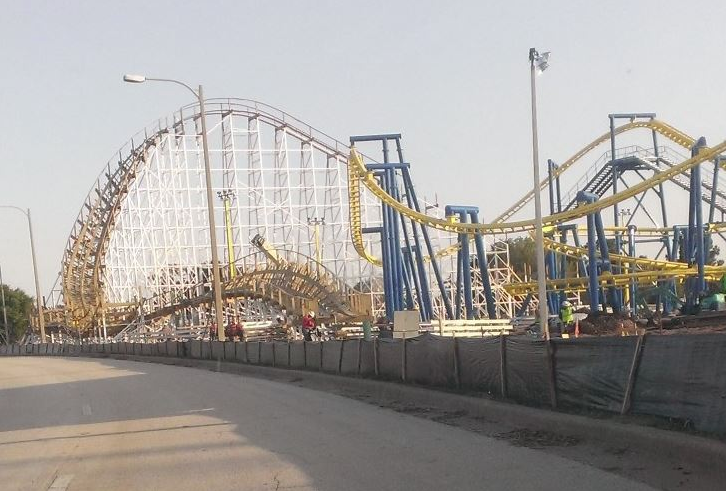 The Coney Island Cyclone also opened with the next segment of its multi-year refurbishment complete. 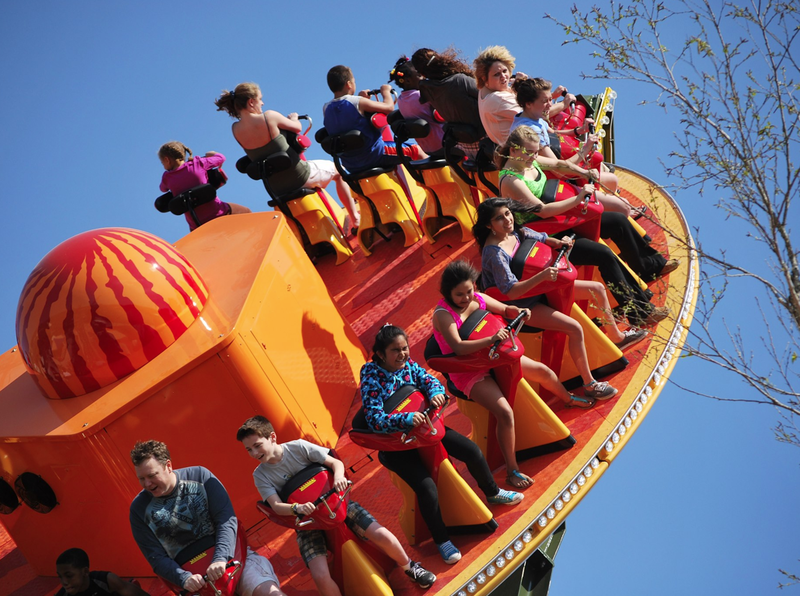 Many fans of the ride make it a tradition to take a spin on the Cyclone on opening day, and they were relieved that the famous ride was ready and open. Even the Spook-A-Rama, a part of Deno's, was ready to go with a brand new dragon animatronic on top of its structure. Additional stories on the reopening of Coney Island can be found from New York Times, the local ABC affiliate, and even Good Morning America. 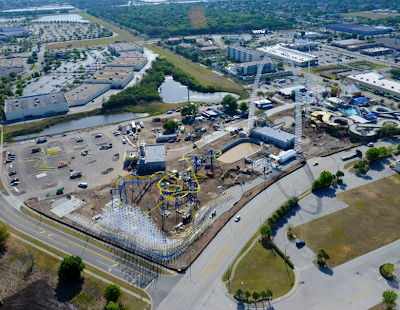 It has been a couple weeks since we checked in with Fun Spot America, and the park has made quite a bit of progress in that time. They just released some new aerial photographs showing off all that has been completed so far - and that list keeps getting longer. The Freedom Flyer inverted family coaster looks complete! That bright yellow track really stands out, especially right now against the brown dirt underneath it. That will eventually become more of the park, naturally. We saw the park's giant SkyCoaster go up a few weeks ago, but these views really show just how it towers over the park's expansion. You can also see that they have prepared the main midway that will stretch from the new entrance to the park all the way to the existing section. Perhaps it is obvious and I'm missing it, but I'm not sure what those yellow and white pieces are going to be for that are laying in the parking lot. There's one ride I left out of the paragraphs above, and that's the new Great Coasters Int. designed White Lightning. 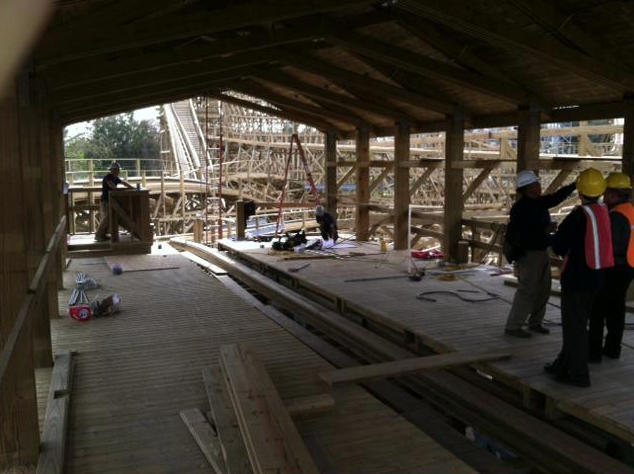 Seen above from ground level, the wood coaster has quickly started to go up using its steel support structure. That first drop is really steep looking! And that turn after it looks like it will be pretty wild! The full selection of the latest shots directly from the park are available here. Google has added some very recent 45 degree images of the Universal Orlando Resort to their maps. I know I've had several posts about the resort lately, but since they're new let's take a look, anyway! Hey look, a Transformers building! One of the quickest attractions we've ever seen built, the show building for the ride went up in the middle of Universal Studios Florida. The outside of Transformers is currently complete, but with walls going up in this photo it couldn't have been taken that long ago. 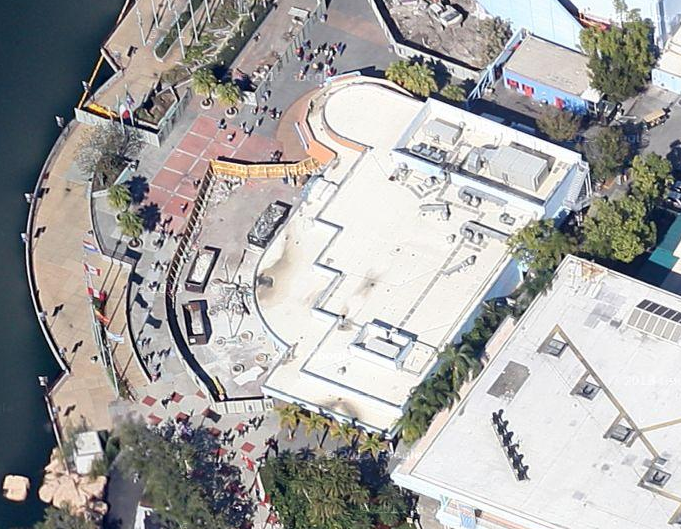 Also walled-off and under heavy renovation are the buildings adjacent to the Simpsons' themed Kwik-E-Mart. The creation of other Simpsons structures is well underway, including the famous Moe's Tavern. Starting to seem like the expansion might be about done before they announce it, but here's the 'secret' Potter expansion underway. 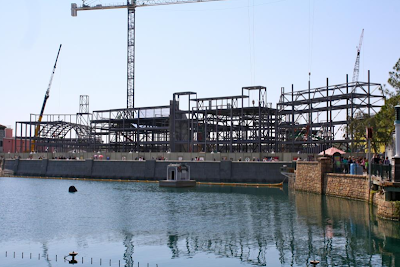 Recent shots from the ground show that steel for the buildings that will make up Diagon Alley are going up - and quickly - meaning the open space seen here in front of the huge Gringotts show building is now filled. Speaking of this expansion, Theme Park Insider has another good scoop on what we may see in the area. In the backstage area between the two theme parks you can spot the (mostly) completed footers for the train ride that will magically transport passengers between the Wizarding World at Islands of Adventure and the new area at the Studios. Having an attraction like this connect two similarly themed lands in separately gated parks is both a unique and creative idea, but also a fantastically smart business move. Who won't buy two park passes? Imagine Mom and Dad saying 'no you can't take the magic Harry Potter train to see the rest of the area." Upgraded tickets - cha-ching! In order for the two-park plan to work out, Islands of Adventure needs a Potter train station, too. And here is that being built. 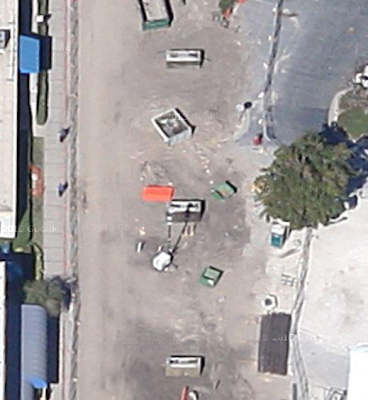 A few buildings from the remaining Lost Continent section of the park were demolished to help make room, and an open area between two sections of Dragons will serve as the depot. Say goodbye to that fake train they have at the entrance next year! I know this is a boring picture, but this is the new Cabana Bay Beach Resort with ground work just starting. The buildings for the resort are now up, so a lot has changed since then. 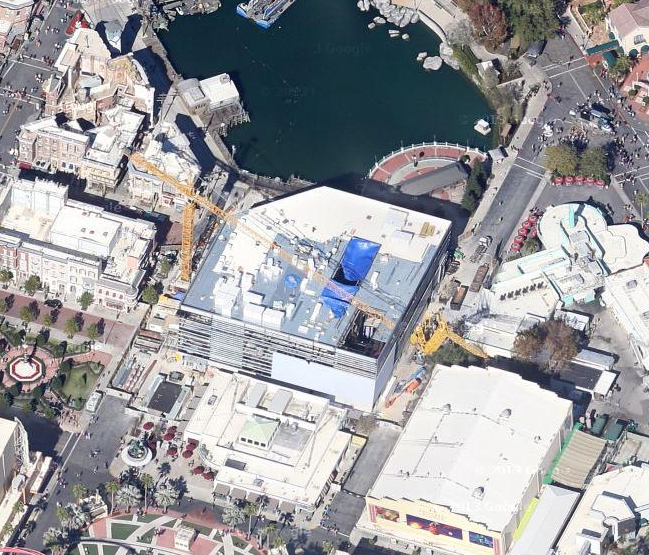 If you'd like to fly around the resort (you can find Gringotts coaster track if you look close) check out the aerials from Google. 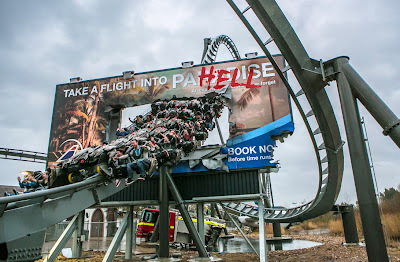 Last season The Swarm debuted (or should I saw ravaged) England's Thorpe Park, and for this season the ride is back and angrier than ever! The roller coaster features five inversions and "wing" trains that feature seats outside of the main track. Riders travel through an apocalyptic like setting of destroyed buildings and other features as the Swarm holds them in their grip. As you can see, things have been a bit rough for Adam. The park's new BEAT THE SWARM site has one mission at hand: help spread the warning that the Swarm is getting ready to attack! The best part? Not only can you help by joining the uprising against the Swarm, but you can get a link to buy some nicely discounted tickets to Thorpe Park! Those who choose to join the game will receive their own unique link that they can spread around the internet as part of their mission. The folks who receive the most clicks on their secret links can win a host of great prizes from the park, including a top prize of a lifetime pass to Thorpe Park. That's a lot of free visits! In its second year, the Swarm has had a brand new 'close call' element added, seen above. The billboard that the train passes through looks closer than close and you have to love how the word paradise has been changed to hell. Fitting, right? Part of the Swarm's wrath for 2013 also includes turning the last two cars around, meaning that riders can choose to take on the coaster backwards! This is the first time that a ride of this design from B&M has featured backwards seats, and starting the ride with a 127 foot inversion backward is sure to be intense! Are you ready to join the fight? I think I am! Is it ever going to stop snowing this Winter? Unlucky for most of the country, but some parts still have sunny blue skies much like those seen in the background of this photo of Full Throttle that Premier Rides shared. 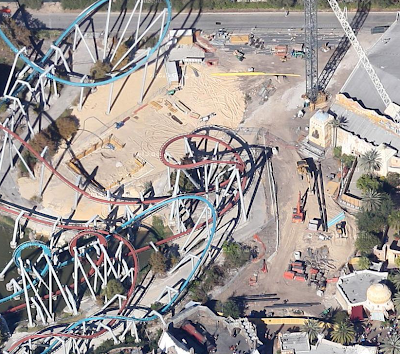 The coaster is actually mostly complete at this point, as it really has a very short layout. 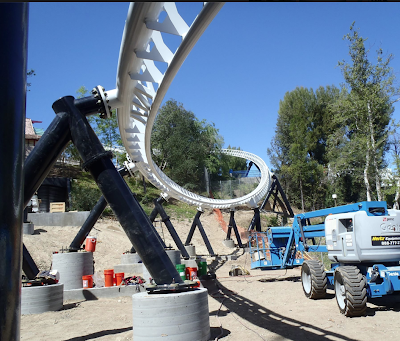 However, the last part to go up is also the biggest - the 160 foot tall vertical loop that will also have track traveling over the top of it. That big element has been saved for last, with the rest of the track complete on one side of it and the launch/station/brakes complete on the other. 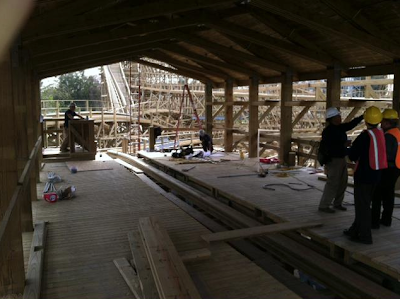 To see the latest photos of the ride's construction, check out this update from Mice Chat. I have to admit that I'm not happy with how this scan came out. 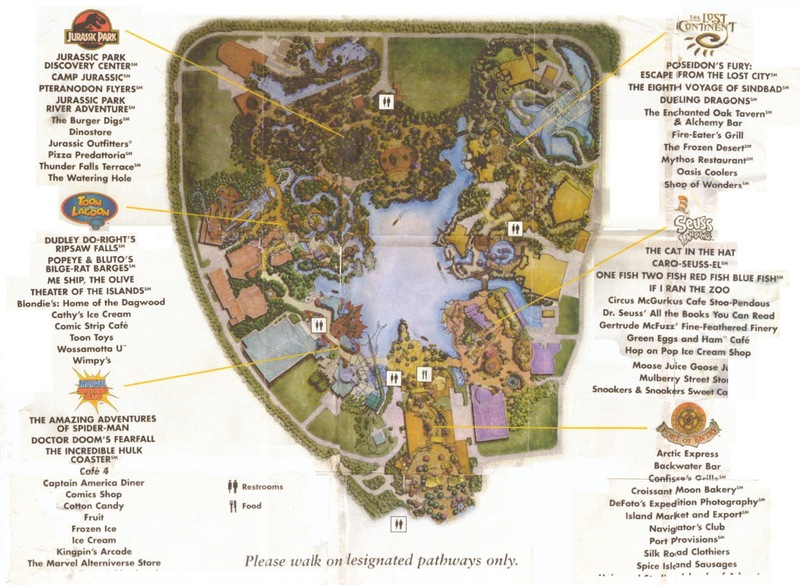 This is an early map of Islands of Adventure, I believe used during test openings and well before the official opening day. Through much time and many new computers, the original file was lost. I did however remember after writing last week's Vault that I had a printed version. Well after some searching I found that literally taped-together print out, and it was in rough shape. I actually think it was in the trunk of my car for a year at one point, but that's another story. So I guess my point is please excuse the quality of this one - not up to my standards but I also haven't seen it online anywhere else so I soldiered on and kept scanning. The map is clearly drawn off of the park's blueprints, which I love. I remember before the park opened I stared and stared at this, examining everything on it. You can see the large open spaces that were left for expansion, the one at the top is now Harry's home. While very hard to see due to the quality, the dark rides even had their paths drawn faintly in on their buildings, Spiderman included. Also the Unicorn coaster and spinner in the Marvel area were not drawn in, either. The layouts of all the rides are accurate, log flume, river rapids, coasters, etc. Just don't look too close at the tape mark in the middle of Dragons. I'd love to know what kind of rides and attractions have been planned for those open spaces over the years, wouldn't you? There have been many rumors, some strong ones even, but aside from Potter the free spaces still exist, even now. Once the next phase of Harry opens at the resort I can't wait to see what they do next! 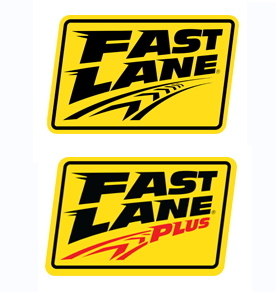 This really shouldn't come as a surprise to those of us who have followed or used Six Flags' Flash Pass system, but Cedar Fair has now rolled out Fast Lane Plus, which is a higher tiered skip-the-line pass for some park's star attractions. Last year all the Cedar Fair parks had Fast Lane, which let you skip the line for popular rides for a price. Basically the parks that now have Fast Lane Plus will charge a fee on top of the Fast Lane fee to be able to skip the line on the biggest and most popular rides. Or in some cases, the ones with the longest and most tedious lines. Take for example Kings Island, where the Plus option will let you skip the line on the Beast - still one of the most popular rides there - but also Firehawk, which is known for its slow loading process and thus a long line. Regular Fast Lane will not let you skip the line on these two rides, but if you pay an extra $10 for the plus option you can. The prices for the feature vary by park, and Plus is not being offered at them all. It looks like only parks with a large amount of rides already a part of Fast Lane are adding the Plus option. On July 4th you can can two Fast Lane passes at Cedar Point for $70 each ($140 total) or if you want to skip the line for GateKeeper and Top Thrill Dragster you can upgrade to Plus for $15 more ($170 total). The reason I mentioned Six Flags in the opening line is because they've been using tiered Flash Passes at some parks for years now. I just priced Six Flags Over Georgia for two guests on July 4th also, and the price for two ranges from $60 total for two passes at the most basic level, to $165 for two for the Platinum level which includes Dare Devil Dive and other bonuses. So really, Cedar Fair's new Plus system is essentially making them more in-line with what the industry is already doing. Other Cedar Fair parks listing the plus option are Canada's Wonderland (Behemoth and Leviathan), Carowinds (Intimidator and Nighthawk), and Kings Dominion (Intimidator 305 and Volcano). The Theme Park Guy has returned from a trip to the warm and inviting land known as Mother Russia, I kid, but no really he did just visit the country and has sent notice of a couple interesting updates. Especially interesting to those of us who have a much smaller geographical footprint than him - it is not easy to find updates like this! The 2014 Olympics will be held in Sochi, and that will happen in under a year at this point. Naturally a lot of fun stuff gets built where the Games are held and in this instance that includes a theme park. Sweet! The park is being built right next to the massive stadiums going up for the event, and will be themed to Russia's history according to Mr. Theme Park Guy. 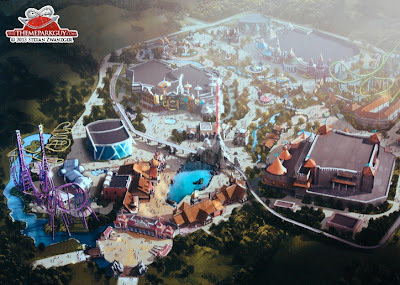 A taste of the concept art can be seen above and we can easily pick out a giant purple Boomerang, an extended wild mouse and a Mack launched ride. 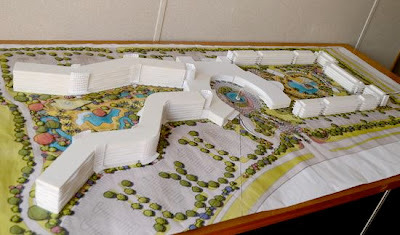 Click on over to the Theme Park Guy for the full update on Sochi park. There's also an update that features the space that will one day include the first indoor Universal Studios park in Moscow. An interesting concept to say the least. Check that out here! Opening day for Cedar Point's newest B&M, Gatekeeper is inching closer and closer. 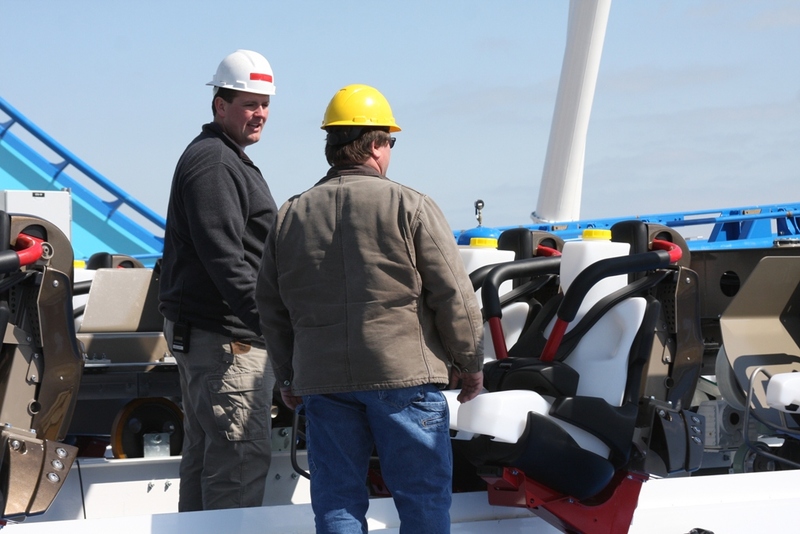 The track has been complete for a little while and as you can see from the photo Eric Lapp (right) and Jeff Durbin (left) from Cedar Point’s maintenance division are getting their first look at train on the track of the new GateKeeper. At 4,164 feet long, GateKeeper is the longest winger-rider in the world! The ride which runs along Lake Erie and across the park’s redesigned main entrance will also set world records for the longest drop (165 feet), tallest inversion (170 feet), the most inversions (six) and fastest speed (67 miles per hour) of any wing coaster. Cedar Point and GateKeeper open to the general public for the 2013 season May 11. We can hardly wait to get to the Point! "London-themed Thrill Park" Coming to the Vegas Strip? The Las Vegas Sun ran an article yesterday about how Las Vegas doesn't really need a third observation wheel, but the news of the possible third one caught my attention because it was mentioned as being a part of a "London themed thrill park." A what? 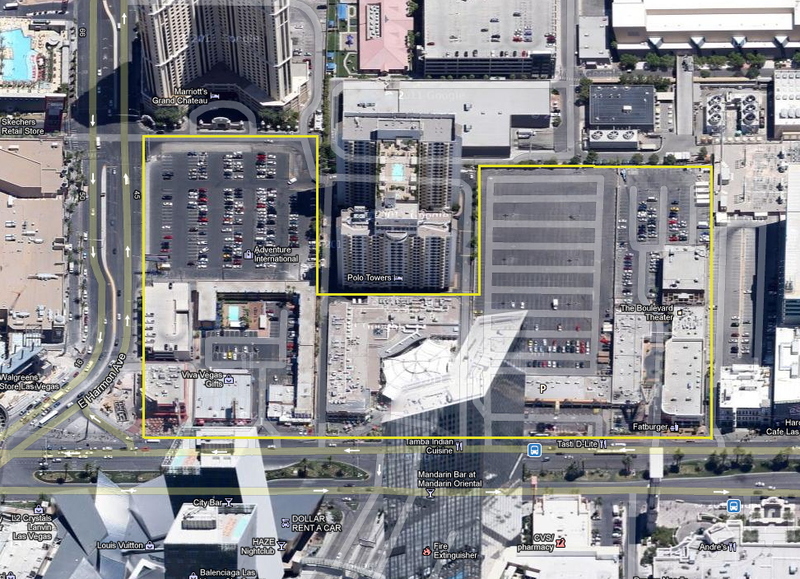 First, this obviously begs the question of whether amusements will return to the Strip - but then again many things proposed for Vegas are never more than a proposal. Also, the details are thinner than thin, basically just that one item the thrill park would have would be called the London Thrill and would be an observation wheel. The land that would become the thrill park is sort of across from City Center, along part of the long walk between the MGM Grand and Planet Hollywood. The project would cost $50 million, and no more details from the developer are being shared. These hints at the plan only came out as the result of a visit to the zoning commission so the developer could ask for temporary retail stands during construction. I'm interested to hear more of what is planned. Is this traditional thrill rides or things like zip lines over bars and lounges? Also a thought - is it weird that they used the phrase "thrill park" and that's what was used for the Orlando Thrill Park? That might just be a coincidence, though. 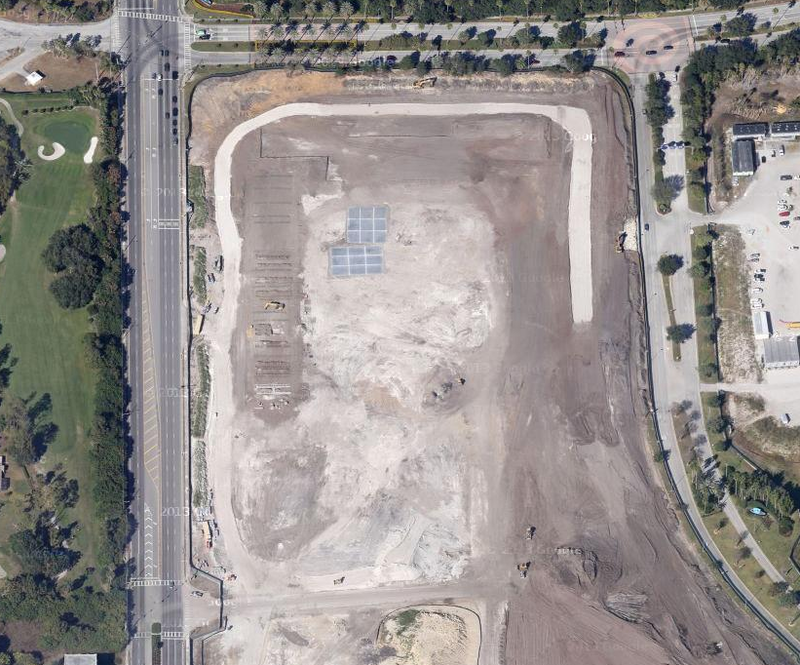 If this turns out to be nothing, there still will be plenty of new water park activity in the area, though. 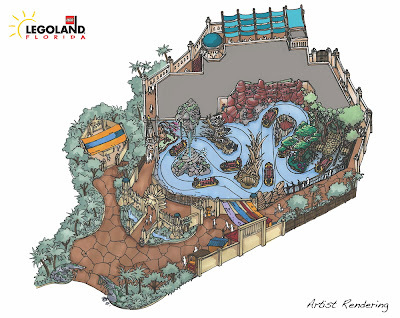 We've already got Wet'n'Wild Las Vegas and Cowabunga Bay. Plus Genting is now planning on finishing the failed Echelon project on the North end of the Strip which will include a gigantic indoor water park. Oh, and Circus Circus has plans for a decent sized outdoor water park as well! That's a lot of waves, but naturally my interest is peaked by this supposed London themed thrill park. More details, please! It wasn't too long ago that Long Island's Splish Splash water park announced Bootlegger's Run, a new hydromagnetic water coaster, as the park's star 2013 attraction. Fast forward a bit, and the new ride is currently being constructed at the park. 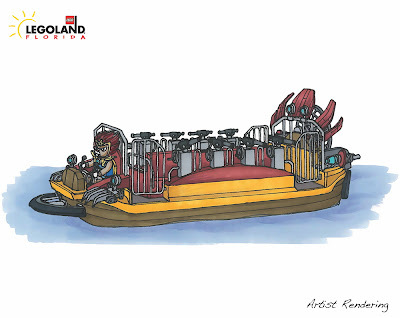 Seen above, the ride's final color scheme matches the patriotic red, white, and blue that was shown in the concept art. More photos of the ride being built can be seen in this gallery from the park, but they're a bit outdated so I wouldn't be surprised if the ride is structurally complete at this point. 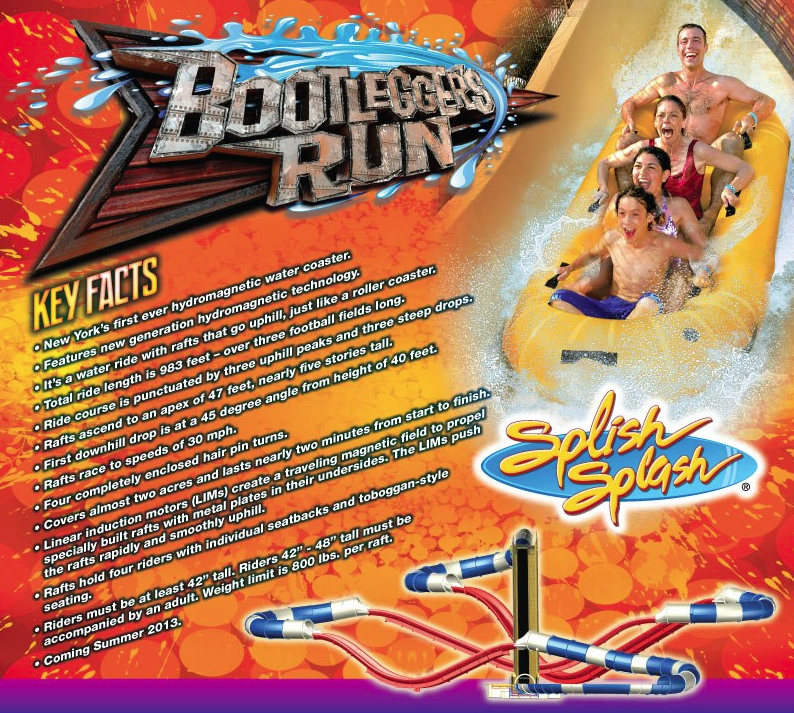 I also wanted to share this neat infographic the park released on Bootlegger's Run. There's some additional details of the attraction in there, including a specific course length of 983 feet and a maximum height of 47 feet. Splish Splash is a part of Palace Entertainment, which owns water parks all across the nation. Hopefully this instillation of a Proslide water coaster will just be the first of many! Considering the park's new thrill ride, TailSpin, was just constructed in the weeks before Wild Adventures opened for the season this past weekend, I thought it wouldn't be ready opening day. I was wrong on that one! When the park opened this past weekend TailSpin was ready to spin, twirl, and rock riders at the Georgia amusement park. The local ABC affiliate was at the park just before it opened to the public to check out the new attraction. You can see video of one of their team taking a test spin on the ride, duct taped microphone included! Wild Adventures is open weekends for now, but will start daily operation around Memorial Day - the park's full calendar is available here. From the various pieces of concept art that Universal Orlando has released for their currently under construction Cabana Bay Beach Resort I've had a hard time really understanding the layout of the property. The scoop that the Orlando Business Journal got on the resort has clarified that nicely, take for instance the photo of a model of the property above. According to the story, which also has some video that shows off the model up close and views of the buildings now standing, the section on the right side of the photo will open first. The lobby, dining, and bowling lanes will be in the central U-shaped structure in the center. 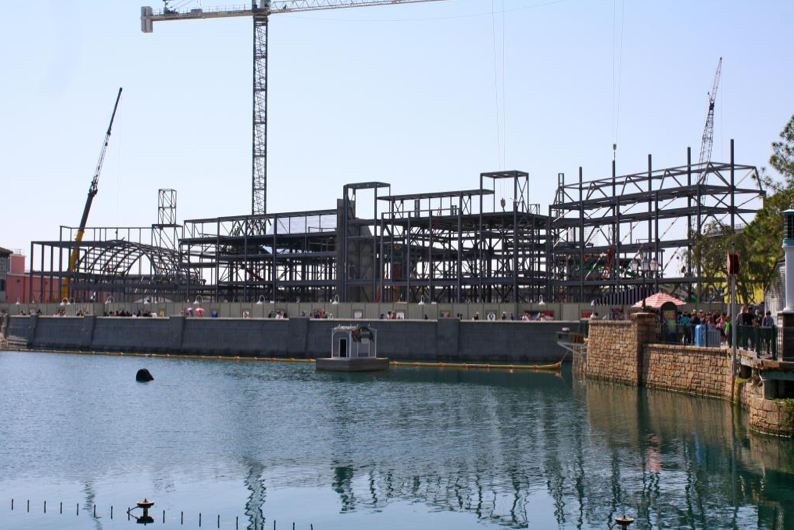 The first phase of the Cabana Bay Beach Resort will have a large pool and parking located adjacent to the four story buildings. When complete the resort will have 1,800 rooms. The second phase will have slightly taller towers, another large pool and a nice sized lazy river as well. 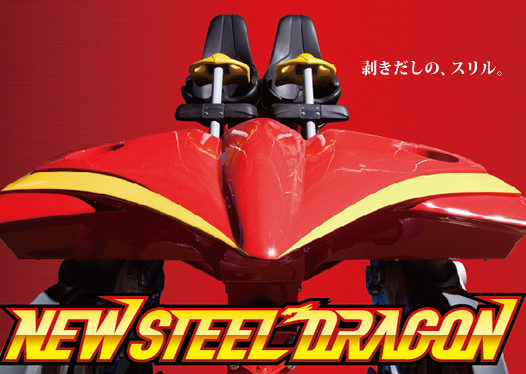 Steel Dragon 2000 - apparently now known as the New Steel Dragon - at Japan's Nagashima Spa Land has opened with some sweet looking new trains manufactured by B&M. I'm no expert, but I believe that in the past B&M only created trains for rides built by other designers a handful of times, if that. For instance, they created the trains for Six Flags Magic Mountain's Psyclone, the only time they ventured into the wooden coaster field. But back on track - the new trains replace those that opened on the 300+ foot tall Morgan Hypercoaster in 2000, trains that were pretty much universally regarded as above-average ugly. The new trains have the look of B&M's mega coaster rolling stock, but still use similar mechanics as the Morgan's 'under the hood' if you will. It's an interesting look indeed - but I'm sure the coaster is already giving riders a much better experience as a result. It will be interesting to see if this is a one time thing, or if B&M is putting themselves out there as train designers as a new revenue stream. I'd love to see several North American coasters have their trains replaced with a B&M design! For more shots of the trains, check out this post from Vertical Horizons. 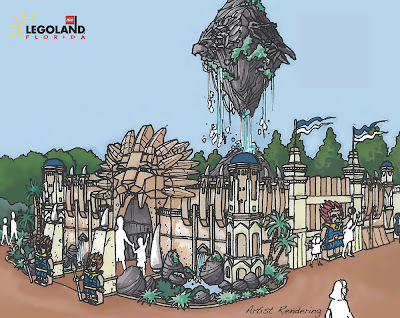 Today a major expansion was announced for Legoland Florida - a new area of the park will be opened this Summer called The World of Chima, and will be presented by Cartoon Network. Almost a mini-land, the World of Chima will feature one large water ride, a character meet and greet area, and an interactive Speedorz Arena. 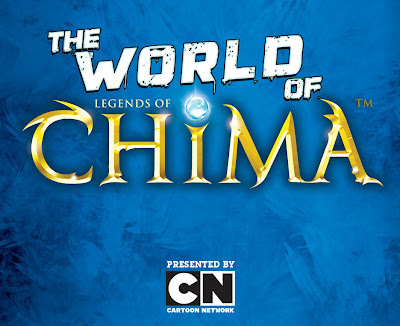 Legoland Florida's Chima themed expansion will coincide with the Lego brand of the same name debuting a major new product line and a new animated show to air on Cartoon Network. 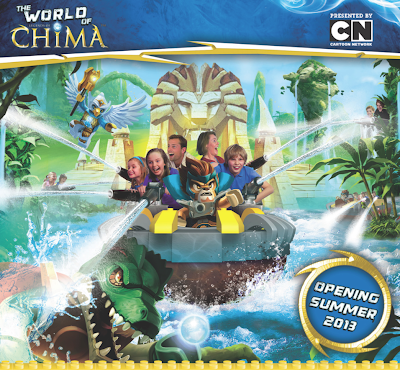 Legoland Florida will be the only place in the world that fans can go to be fully immersed in The World of Chima. Given the detail apparent in this concept art of the World of Chima entrance area, the amount of theming is going to be top notch. "Guests will enter The World of Chima through a fantastical stone and moss covered entrance which leads to the Lion Temple at the base of the majestic 45-foot tall floating Mount Cavora." 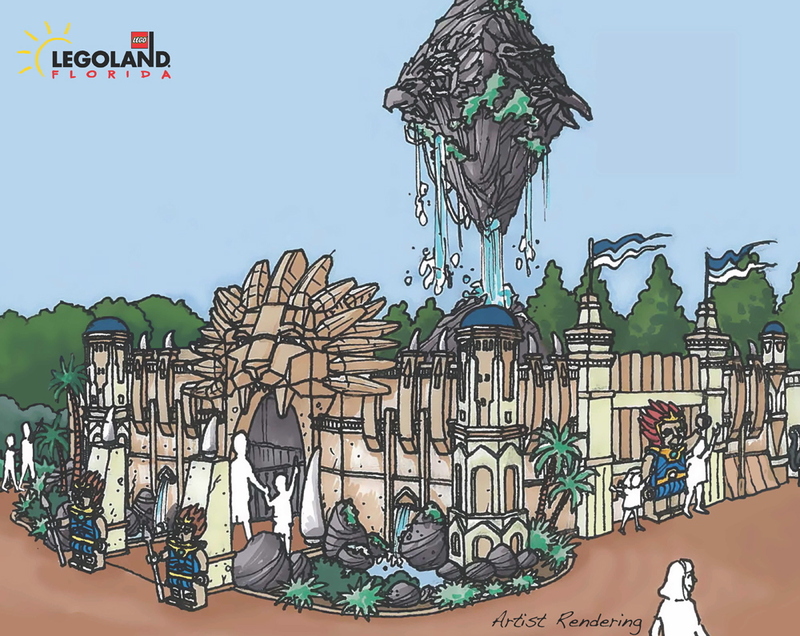 When I first looked at this concept are I figured that floating island was just in the imagination of the person who drew this, but no, it really will be hovering 45 feet above the area! How neat! 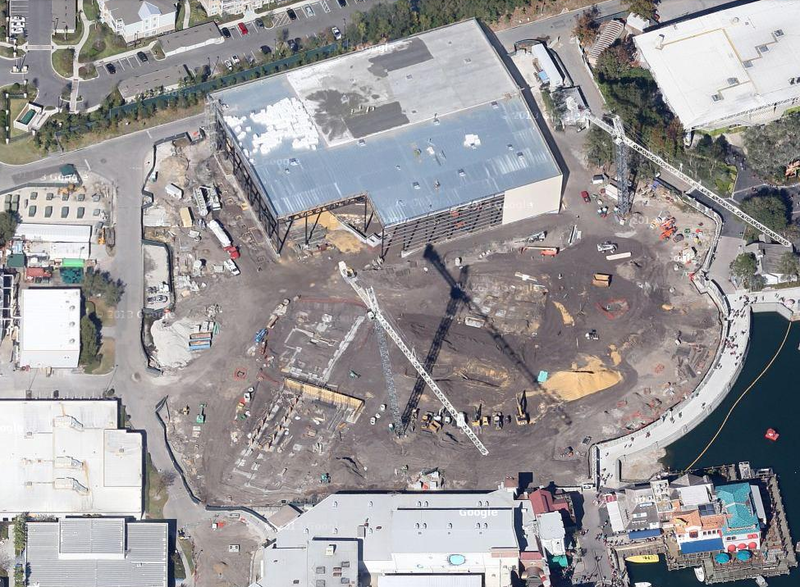 Here is a wonderful aerial view of the entire expansion. The main ride of the area is an interactive splash battle style attraction, named The Quest for CHI. 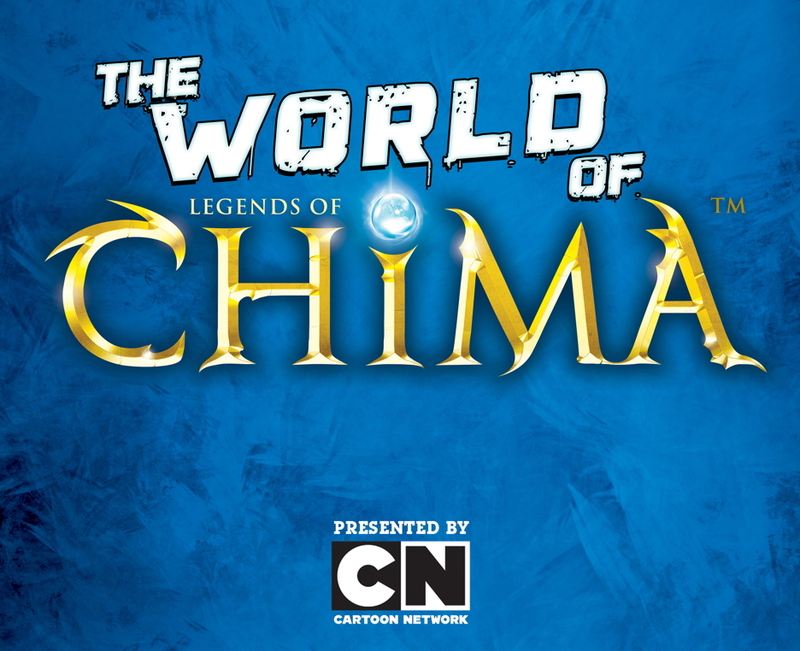 CHI is the magical power source in the World of Chima, of which the highly advanced animal tribes are battling over. 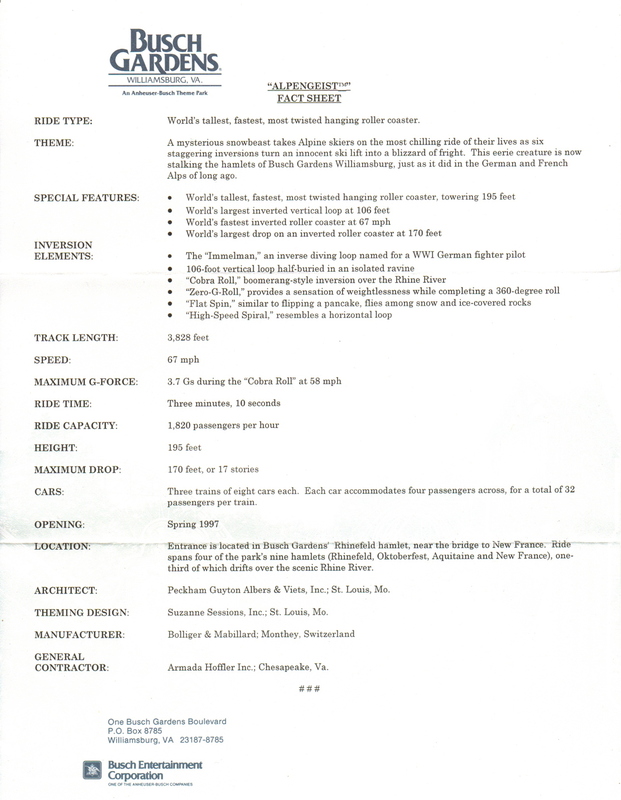 As for what will be featured on the ride, the park's press release details that nicely. 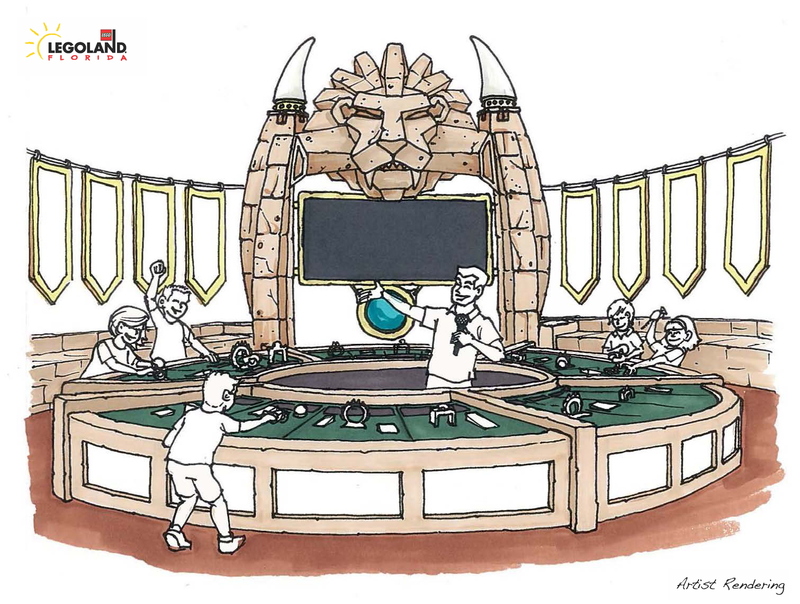 "Guests will explore a diverse landscape setting and join the Lion Tribe in an epic battle to recover the stolen CHI orbs. 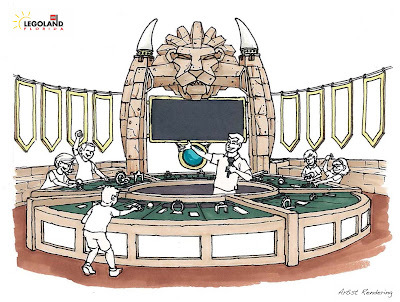 Guests will board a watercraft which will take them on an interactive experience using water cannons to help their hero, Laval the Lion Prince, defeat Cragger the Crocodile King as he attempts to steal the precious supply of CHI." The release continues, "the journey will take them through the land of Chima where they will meet some of the highly advanced animal tribal habitats, including the Rhino Quarry, Raven’s Roost, Eagle’s Nest, Wolves Encampment, Gorilla Forest and Crocodile Swamp among other imaginative settings." It looks like the load and unload areas will be inside a building, providing potential for an even thicker layer of theming. The above rendering of a ride vehicle from the Quest for CHI shows off the attraction's interactive nature - each rider will be armed with their own water gun to blast at targets and perhaps people along the way. This is a drawing of the Speedorz Arena, the seen on the left on the aerial view above. Described in the release, it is a "super-charged, super-fast Speedorz Arena where multiple players build their Lego Speedorz and compete to win the precious supply of CHI by participating in group challenges and competing in a series of obstacles." An adjacent character meet and greet area will allow guests to see Laval the Lion Prince and Cragger the Crocodile King during the day. 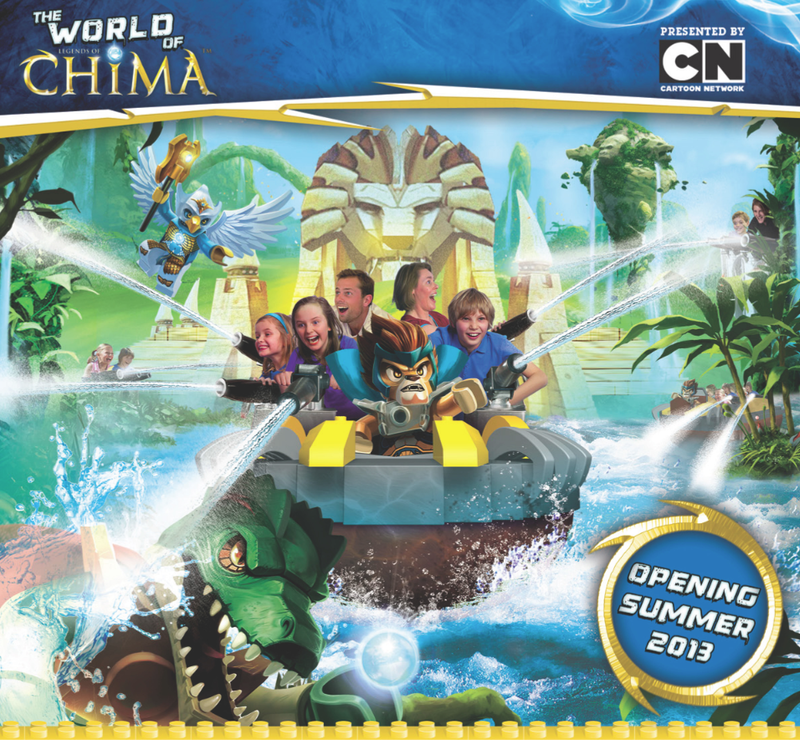 While not technically inside the World of Chima expansion, Legoland Florida will also open a new Lego Chima 4D Movie Xperience film experience based off the characters and their world. One final shot from today's announcements of the actual construction site. Work is well underway, you an see some of the area's structures rising in the background. I also see some familiar faces in the crowd from the announcements, many other website writers were there! As for where the expansion is being built inside the park, it will be in the shaded area above - just behind the main entrance area. I believe this was a large outdoor concert area when the park was Cypress Gardens. The Chima theme replaces a highly rumored Pirate theme, though if you look at those submitted plans you can see how the basic design was still used. I'm still so happy to see the park thriving overall, after many naysayers said its location was just too remote to work. I can't wait to see how the finished World of Chima turns out - it certainly looks to have the potential to be quite impressive!